If you’re up to date with my experiments you’ll know that I’ve been following Eat Right For Your Type (I’m blood type O) as well as having cut gluten and soy out completely – all in the name of eliminating joint pain. It is working well. Thought I would share this fantastic recipe which I have adapted ever so slightly from Peter D’Adamo’s “Cook Right For Your Type” Cookbook. It is good for all the blood types except for A’s. You can find the original on p.228/229, from the 1999 edition. There are four of us in our household, each representing a different blood type. Sigh. Challenging for me at times, being the cook, though really I’m the only one who takes it seriously. My daughter who is type A, is undoubtedly a true vegetarian- since birth I’ve watched her preferences towards food and without persuasion she avoids meat, doesn’t like it except for Turkey from time to time. I have found it interesting to watch the kids natural evolution and relationships with food. For me it was quite different growing up in the 70’s – I ate everything and learned to love everything I ate regardless of how it made me feel. How it made me feel was inconsequential, for didn’t you know there were people starving in the world. It has taken me some effort to take the time to assess how my body relates and reacts to each food. Most of the foods on my beneficial list (according to D’Adamo) when eaten in moderation fuel my body with nutrients and sustenance to get me through the day and for my workouts. I have found that I eat less at each meal, not by choice but rather because my body is absorbing the required nutrients which register to my brain that I’ve had enough. I am truly amazed, being someone who could eat and eat…I used to seriously wonder if I had a tape-worm! As a result, however, I have to refuel more often throughout the day. It’s all good as long as I’ve got leftovers and my vegetable drawer is full. Where I live, Fall is creeping in. The days are cooling off which is the perfect excuse to start making my favourite Fall/ Winter stew dish. It’s very simple, though it does take some time to make, but well worth the effort. Serve over Brown Rice, your choice of pasta or with a crusty whole grain bread. It’s one of my favourite leftovers. 1 large bunch of fresh Green Kale, steamed for 4-5 minutes, let cool, then chop into bite size pieces or to your preference. Heat a large high-sided pan over medium heat. Add Olive Oil. 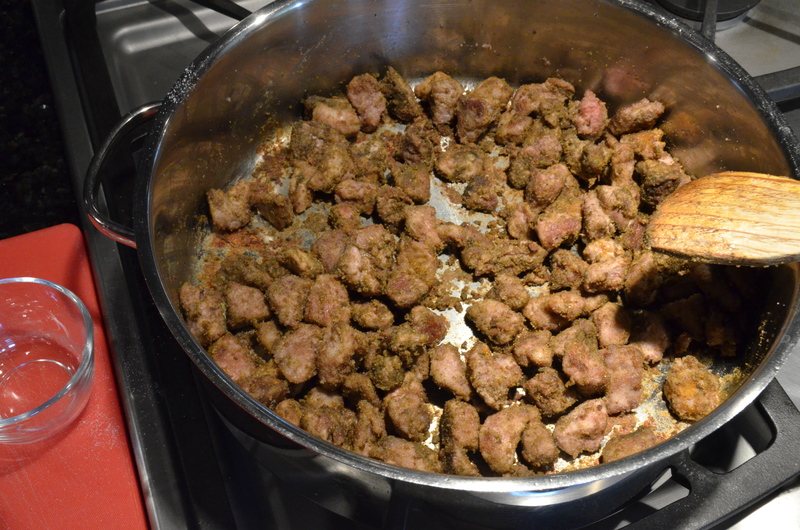 Once Olive Oil has heated up slightly, add lamb cubes. Heat until browned nicely. (Depending on the size of your pan you may need to do batches). 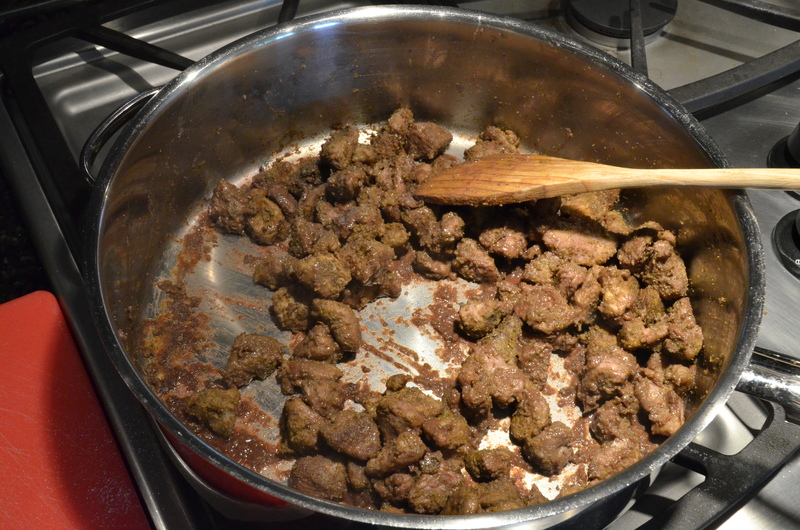 Once the second batch of meat looks nearly browned add the first batch back to the pan. 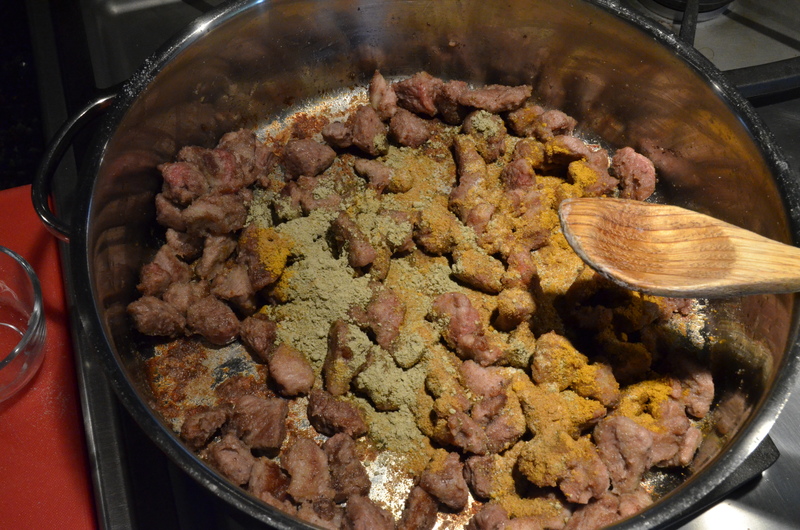 Add the spices – Ground Cumin, Madras Curry, Kelp Powder & Salt. 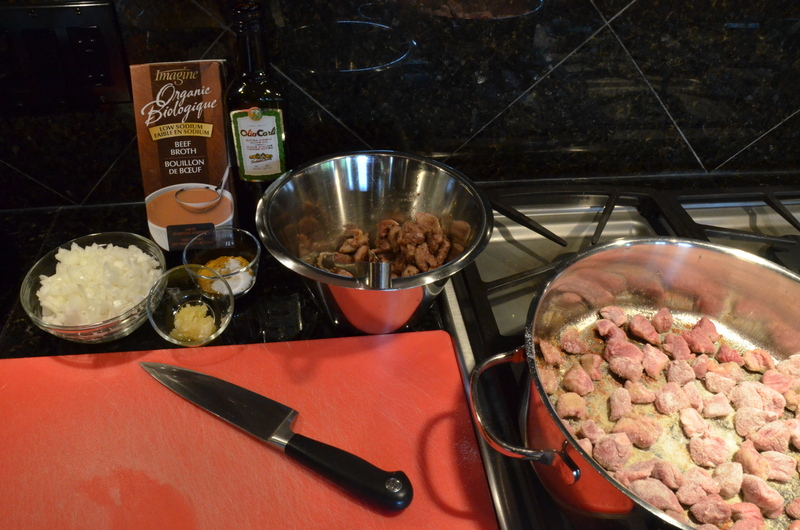 Combine the spices with the meat. Cook for 5 minutes on low heat. Add 1/3 Cup Red Wine to deglaze. This means to unstick any of the browned meat or flour that has become welded to your pan. So with a wooden spoon, stir and scrape until most of the stuck stuff comes off. Mix it nicely with the meat, this is the flavour of your stew. Add the chopped Onions and Garlic. 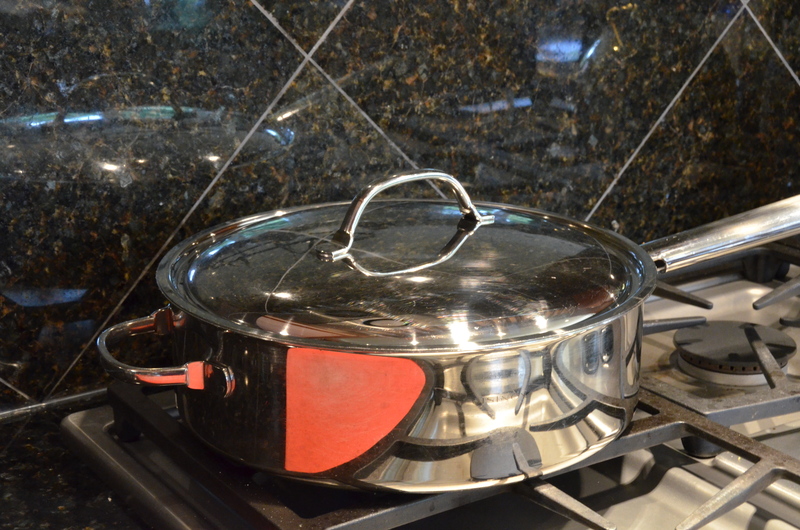 Cover the high-sided pan or pot with a lid. Simmer for 1 hour. Which means turn the heat down to low, depending on your element. Looking for very little bubbling action. Check to see if the liquid is drying up. Which is unlikely, unless you have your heat too high. If so, add more stock. I never need to add more liquid. After 1 hour, add chopped Carrots. Stir them in. Scrape the bottom of the pan at this point. 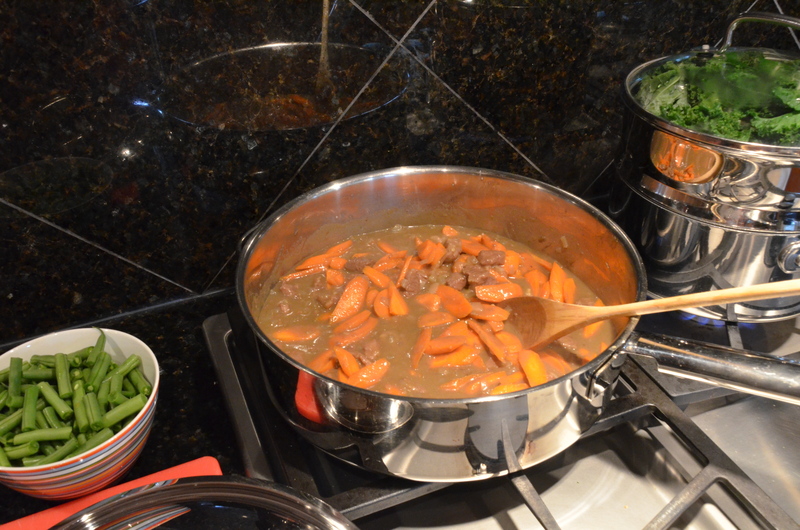 It’s ok if the stew is sticking to the bottom, scrape it off and mix it into the stew. It adds more flavour and more thickness. 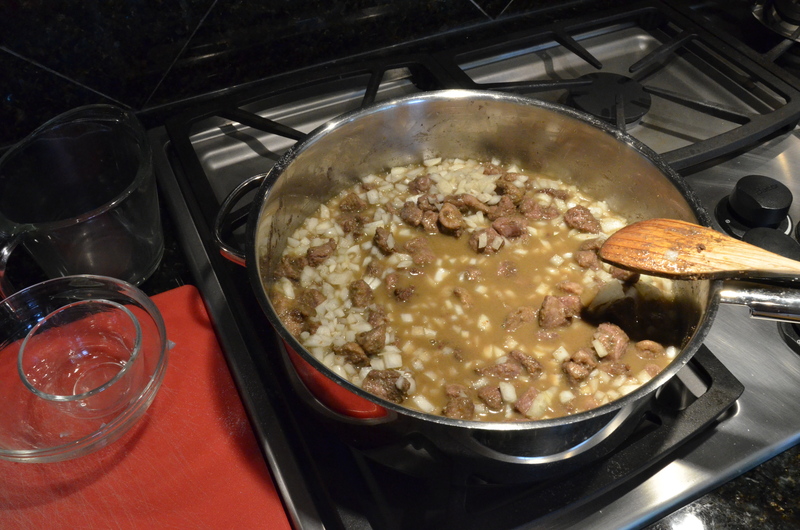 Cover with the lid again and simmer for 30 minutes. Concurrently, steam up the Kale for about 4-5 minutes. Let it cool, then chop it up and set it aside. 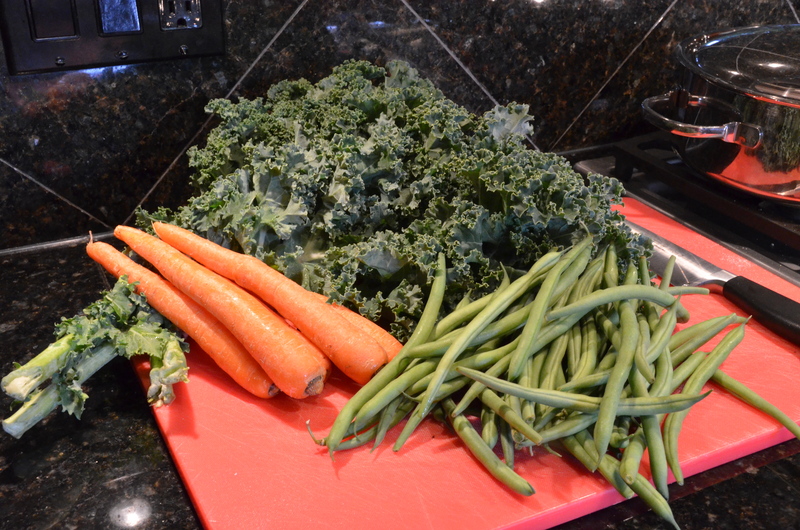 Add Green Beans and steamed/chopped Kale, continue cooking uncovered for another 10-15 minutes. 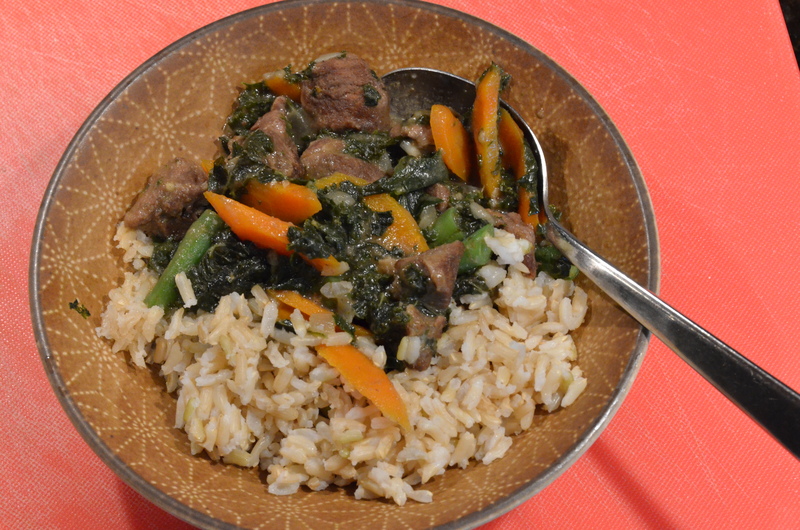 Below is the finished product with Brown Rice. Yum. I’m really a warm weather person but looking forward to meals like this gets me through the cold months. Let me know if you give this recipe a try. Enjoy! I gave this a whirl tonight with some minor changes and it was great! I used Turmeric instead of Madras Curry, parsnips instead of carrots, skipped the kelp powder because I have no idea where to get it, upped the garlic to 10 cloves (everyone said add MORE!) 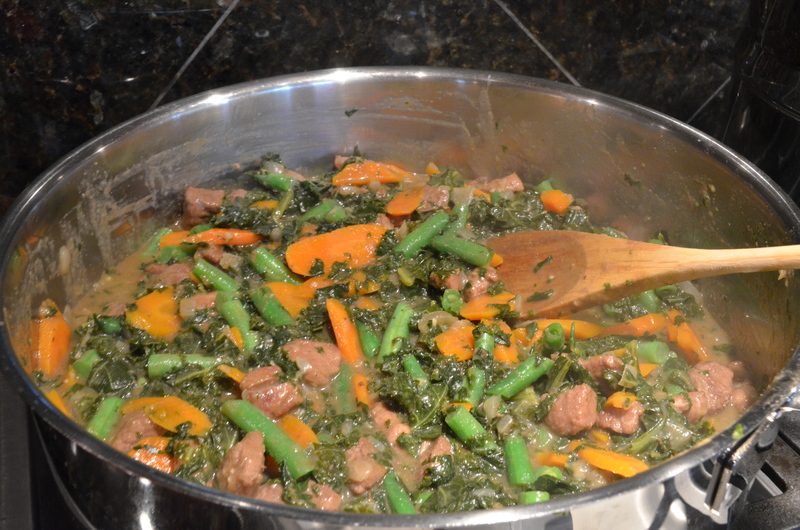 and threw the kale in without steaming it (why mess another pot?) 15 minutes after the parsnips and everyone said it was a keeper. Thanks for a great recipe! I’ll give your recipe a try. Since originally posting the recipe I too have stopped steaming the kale first, unless I have some already in the fridge (which is always the case these days! ).